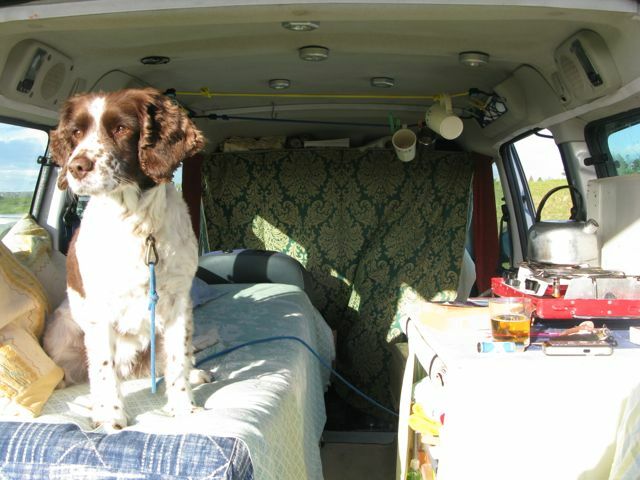 I recently received an email from a guy who was telling me about his Citroen Berlingo camper van conversion. 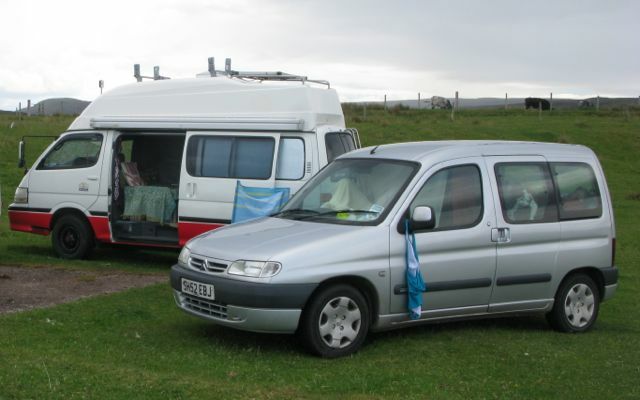 Well it just so happens that Jo who is camping here also has a Berlingo that she's converted into a mini camper van, and is travelling around Scotland in it. Jo originally showed me around her van set up at Applecross, so this time I made some pictures to share with you so you can see just what can be done with a smaller, but very spacious vehicle. Here you can see in through the side door, and just to Maisey's left you can see the kitchen unti with gas burners that Jo has installed. There's plenty of storage space under there too as you can see. There are also some very useful lights beside the speaker above the cooker (and on the opposite side) and she has put up some additional LED lights on the head cloth. You can see a mug hanging from some coated wire installed along the ceiling too – storage space used creatively. A great thing about the Berlingo is that it has a sliding door on both sides, so as you can see here, its possible to lay on the bed and have the door open next to you. The photo above shows the view in through the back lift-up door. This type of door is great for keeping the rain off and you can sit out under it even if the weather isn't dry. You can see the bed well here, which has been attached to the side of the van with some hooks to keep it from moving out of place. Theres also storage space under the bed (side door access too) so all manner of useful things can be stored here. In Jo's van she has a dutch oven and a barbecue here. You can see the curtain hanging behind the bed in front of the cab in this shot, but the curtains have been made so they can also be hung right around below the main front windscreen – they're all on velcro strips for easy fitting and removal. 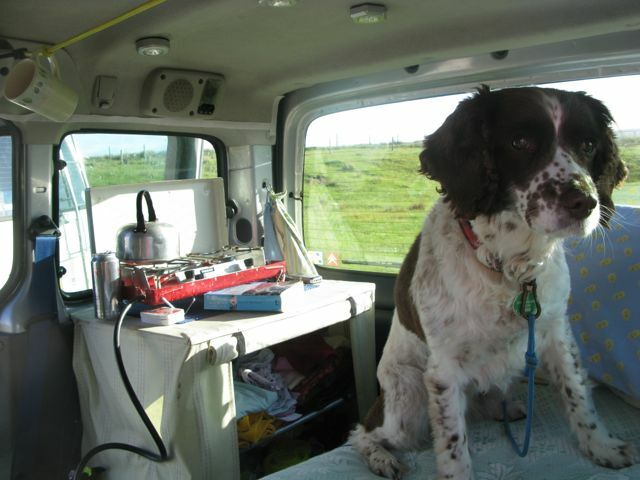 In her van, Jo has a 25 litre water carrier and a portaloo, both of which fit neatly behind the driver and passenger seats, not taking up much valuable space in the living area. She also takes full advantage of the storage shelf above the front windscreen and has everything needed within arms reach there. There is also room in the back for her folding camping chair, LPG gas bottle, and artists materials, as Jo likes to paint the beautiful scenery she sees on her travels. All in all a great little camper van conversion, and I must say that I was really impressed by the spacious feeling in the van even with all these things installed. Very comfortable travelling!